In this lesson, we will learn how to use the Quadratic Formula to solve quadratic equations. This method is usually used when it is too difficult to solve the quadratic equation by factoring and other methods or when the solutions are not integers. Step 2: Plug into the formula. The ± sign means there are two values, one with + and the other with –. 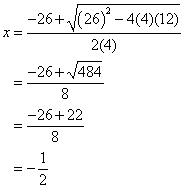 Quadratic equations have at most two real solutions, as in the example above. However, some quadratic equations have only one real solution. If the quadratic equation has only one solution, the expression under the square root symbol in the quadratic formula is equal to 0, and so adding or subtracting 0 yields the same result. 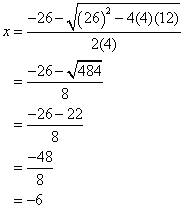 Other quadratic equations have no real solutions; for example, In this case, the expression under the square root symbol is negative, so the entire expression is not a real number. Note: You do not need to know this formula for the SAT. This implies that the quadratic equations that you will encounter in the SAT should be simple enough to be solved by the other methods. Using the Quadratic Formula to find solutions to quadratic equations. Two full examples along with the formula are shown. Solving quadratic equations using the quadratic formula.